To inculcate the leadership qualities in students and to give them a feel of functioning of the administrative body, a school cabinet was formed and an investiture ceremony was organised by Shemrock Senior Secondary School, Sector 69 to nominate students for various appointments in the school. Air Cmdre.(retd.) R.S.Sodhi VSM Director Adm.,punjab state institute of sports, graced the occasion as the chief guest.The ceremony started with the national song and the shabad Deh Shiva bar Mohe to motivate children to imbibe the wisdom ingrained in the shabad .The newly elected members of the council were conferred the badges and flags by the chief guest.Rupal Vashisht appointed as Head Girl and Loveneet Singh Singh appointed as Head Boy, while Krishna Kumar appointed as Sports Captian. GurKanwal Singh as Oxford House Captain, Gurleen Bhandari as Cambridge, Abhishek Jagota as Harvard & Anupreet Kaur as Stanford Captian of the school Houses. The chief guest while motivated the students to do the best in their lives. According to him the investiture ceremony in schools is an occasion for great pride. For those chosen by the school to shoulder the responsibility it is not just an honour which makes you stand a step ahead of your peers, but is also a reminder that you have duties to perform.While Addressing students, Director Principal of the school S K sharma said the school had bestowed a huge responsibility on them and they should carry out their duties in such a way that they set an example for the entire school. He brought out the need to shoulder responsibility and develop leadership qualities to the students. The members of the school council promised to strive for perfection in all endeavours and take their school to greater heights of glory. 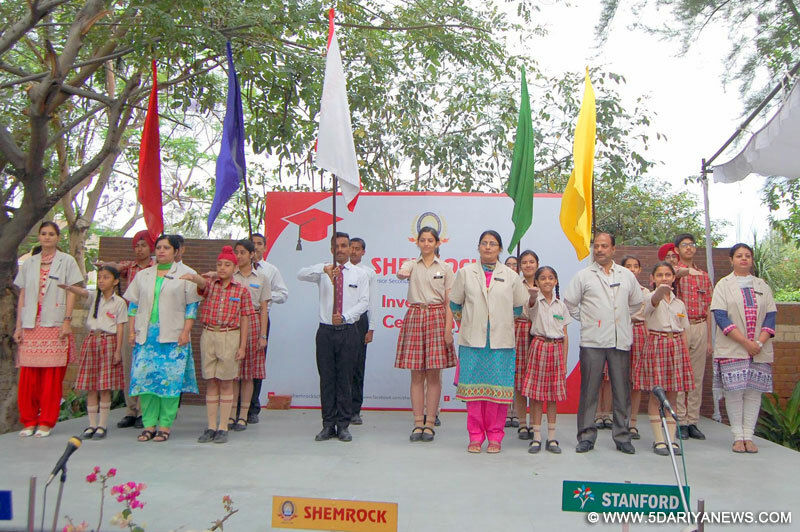 Shemrock School celebrated Republic Day with fervor at its campus. Result of 10th standard of Shemrock school is 100%, 13 students got 10 C.G.P.A.